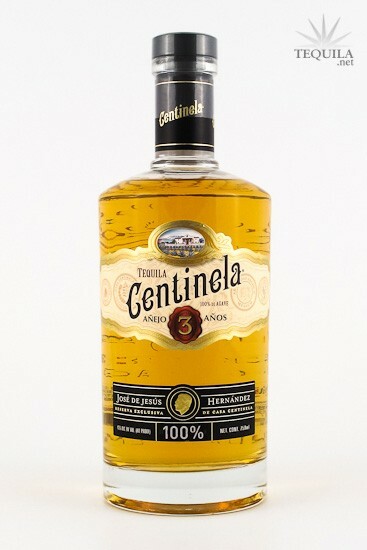 Tequila Centinela Extra Anejo is 100% Agave and aged over three years in previously used bourbon barrels. 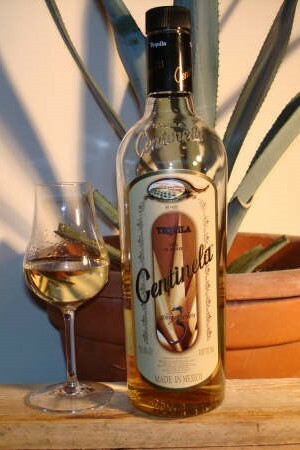 Tequila Centinela was established in 1904 and was the first distillery located in Arandas, Jalisco. Centinela means "the one to watch and keep". The process has not changed; we combine tradition with top technology to ensure the consistency in our products. Our Agaves take approximately 8 years to mature, and are hand-picked at their peak from our own Agave fields. We also buy 20% from local producers to help the region's economy. Our Jimador's are hired as full time workers and are paid a salary. The Jimador's are trained to cut the pencas extremely close to the pina to prevent any bitter flavors during cooking. We take our time cooking the Agave as this is crucial in our tasting profile. We use a clay oven (compared to others that use stainless steel ovens) that gives our cooked Agaves a smoky flavor, and a sweet after taste. Tequila Centinela slow cooks with steam and this process takes approximately 24 hours. 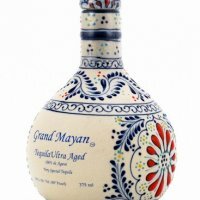 In the first 4 hours we get, by gravity, some liquids from the cooked agave that we discard, to eliminate impurities and "the amargo" (the bitter). The cooked Agave is then allowed to settle and cool for an additional 24 hours. For the extraction or the grinding process, we have 2 mills with 5 press each, they crush and wash the fibers in a gentle way. The reason is not to tear the fibers so they don't release bad flavors in the juices (other distilleries use more industrial machinery for this process, like the "diffusor" that cooks and rinses the Agave in one process, it saves time, but it compromises the flavor). The extracted juice is called "Aguamiel" (honey water), and is very sweet with high sugar content, which is what is needed to create alcohol in the fermentation process. The "Aguamiel" goes to the fermentation; Our yeast is natural and it comes from the environment, and is controlled. This process takes from 3 to 5 days, as the yeast starts converting the sugars into alcohol. The first distillation is called "destrozamiento" (5 hours), we get rid of the "heads and tails" (colas y cabezas) and the heart in this process is called "ordinario". The second distillation is called "rectificacion" (10 hours), again we cut the "heads and tails", and now the heart of the second distillation is called Tequila. Once we have our Tequila ready it goes to the aging room, and each of our products is differentiated in this process according to its tasting profile. We age our Tequilas in previously used 200 liter American White oak bourbon barrels. 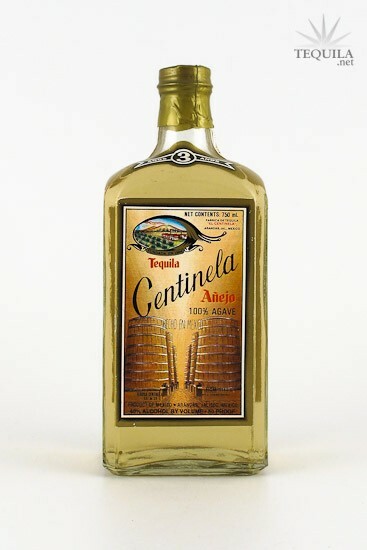 The bottle of Centinela Extra Anejo took a long time to get to me. In fact, it has a Mexican tax stamp dated 2000. It was purchased in April, 2013 by my friend, Phil, at the Hacienda Tequila in Cancun. I visited this same shop around New Year's 2010 and almost purchased this very bottle. Phil calls me from the store and asks if there is any bottle he might buy for me. This is the one I picked. It was a very good choice at $85.00. My label and bottle predate the bottle pictured in the photo that accompanies this review. But any good tequila collector will always go for the oldest bottle he can get (if he does not already have it). It's the same tequila inside - either way. Bottles and labels are different - both are reasonable - nothing special. The SPECIAL is inside the bottle. There is a plastic pourer in the bottle neck of either edition - with a screw-off cap. Getting to the inside - in a Riedel glass the color of the liquid is light straw with a faint green tint (almost like olive oil). This tequila is much lighter in color than you would expect any three year old tequila to be. The legs are thick and viscous - taking their time to drain to the liquid's surface. The nose is extremely complex because it is both sweet and earthy. I detected vanilla and caramel, but also agave and earth. The first sip reveals a rich, thick flavor that is rather yeasty but with only a mild alcohol burn. The second sip delivered notes of sweet roasted agave competing with a spiciness that reminded me of cumin. And so it goes that every sip slips back and forth between sweet and spicy. There is, however, a constant undercurrent of green grass and green olives. On the finish, after the third sip or so, there is no alcohol burn. The taste does become rather smokey, however, and I can detect a stronger presence of the whiskey that previously resided in the barrels. For me, the strong suit of this tequila is its finish. I love it! This is my first taste of the 3 year extra anejo. I've always found the brand to be a relative bargain, but this is a real jump in price from the $40s to the $80-100 range. I've been waiting a while to try it, so I hope it's a good as the rest of the line. Aroma: Earthy agave, green notes, wood and a bit of alcohol on the nose. Initial Taste: A spice filled entry with nutmeg and clove. Hints of agave and vanilla as well with the aforementioned green notes. Very complex, but well rounded. Body: A bit thin for an aged tequila. Light vanilla & agave, lots of spice and hints of wood. Finish: A medium-short, but very nice finish. Lots of brown spices and sweetness to go with just enough oak to make it not overly sweet. This was not the usual taste from Centinela. Generally, they are bit more filled with fruit. This is an interesting tequila because even though it’s less sweet than a lot of aged tequilas, it has a nice spice balance that keeps you guessing. Was this tequila good...yes. Was this tequila worth paying nearly $100 for...nope. It's a pretty solid 3 year aged juice, but when you're playing in the Ben Franklin ballpark, you need to be better than pretty solid. Definitely worth a taste, probably not worth the price. 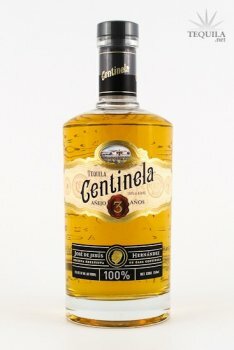 Centinela Tres Anos 100% De Agave Anejo Tequila - NOM 1140. Importer: Haas Brothers. I believe my bottle is the newest presentation of this tequila. I purchased it from Hi-Times online for $69.99 per 750 ml. Sampled from a Riedel glass on 3/5/09. The first thing that struck me about this tequila was that its appearance is such a pale yellow shade for an anejo. The lighter shade though in this case doesn't mean much since this is not a weak tequila in any way. Uniform beautiful tears slowly descended the glass leaving many pearls. First nose has alluring aromas of medium floral and fruit sweetness with a slight smell of beer or bread but very little wood. The taste is full involving a complex creamy agave base with layers of sweetness from mild caramel, vanilla, and butter. It has a surprisingly bold smoky sweet attack that's sharp and warm yet still silky. There is also a moderate amount of bitterness. The finish is a long numbing peppery heat with a bold fade of agave bite and again bitterness. Overall experience is that of a unique anejo that has pleasantly strong aromas, intense flavors and a big finish. Presentation is fairly nice with a screw off special pour top, bold bottle, and embossed labels. This smooth anejo is definitely one of my new favorites. I do not believe it quite reaches its quality/price point, but by all means, give it a try.